In December, the whole city prepares for the upcoming holiday season. The streets are festively lit up and everybody feels the Christmas atmosphere coming. Many people meet to enjoy a cup of mulled wine together with some delicious sweets. Come to Prague to soak up the unforgettable atmosphere. Don't miss famous Christmas markets all around the city, enjoy a cup of hot mead and take a boat ride on the Vltava river. Looking for romantic things to do in Prague? The boat cruise is the right thing for you. Want to try? Order the Advent Vltava River Cruise. Can´t wait to try some new recipes? 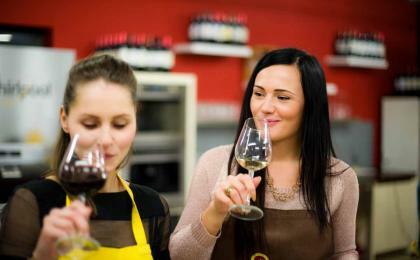 Join the cooking class and surprise your friends with Czech dinner! Want to try? Order your Czech cuisine cooking class. Did you fell in love with vegetarian cuisine? Don't miss the 8 course menu degustation. Want to try? Order a special vegetarian degustation at Etnosvět restaurant. Beer or spa? You don't have to choose anymore. Want to try? Order a unique beer spa. Trying to find a special program for a weekend with friends? Cider tasting is an answer! Want to try? Order your own craft cider tasting. For many people, December is all about Christmas markets and shopping. All of us are looking forward to this time of the year when everything glows and even the smallest corner of the city feels festive. The biggest Christmas market takes place at Old Town Square (2nd of December 2017 – 6th of January 2018). Beautifully decorated Christmas tree and Christmas crib attract the attention of both children and adults. Besides the variety of food such as sausages, traditional Czech sweets or mulled wine, visitors can enjoy a continuous program composed in Christmas style. If you can't get enough of the Christmas atmosphere, you can just wander around the city and you definitely find many more markets everywhere. One of the best is at Prague Castle (26th November 2017 – 6th January 2018). We love this one not only for its venue but also because you can easily leave the crowds behind and undisturbedly immerse yourself in the holiday atmosphere. Do you admire the fragile beauty of ballerinas? So you have a perfect opportunity to visit one of the best world's ballets. Everybody knows the famous story of princess Odette and brave prince Siegfried. Swan Lake from Russian composer Pyotr Ilyich Tchaikovsky is a classic piece that can't disappoint anyone. And if it is presented by Moscow City Ballet Group in Prague Congress Centre, it is a guarantee of a great evening just before Christmas Eve. So don't hesitate and save the date 22nd of December for this experience of a lifetime. If you want to escape from the crowds of the city centre and get a view of Advent Prague from a different perspective, don't forget to book a Vltava river cruise. Relax on a festively decorated boat while watching the breathtaking sceneries of winter Prague. Together with mulled wine, delicious sweets and traditional Czech Christmas carols, it is the best way how to make the most of your stay in Prague. Are you coming to Prague with kids or you just want to enjoy romantic moments with your loved ones while ice-skating? You will find many open-air ice skating rinks around Prague every winter. There is always one at Ovocný trh which is in the very center of Prague. It´s for free, you just pay for the skates rental. Another interesting place where to ice-skate is under the Žižkov Tv Tower. The entrance fee is 250 CZK for the whole family plus 50 CZK for the skate rental. If you get cold, you can warm up with some hot drink in the Miminoo restaurant which is just beside the ice rink. Or you can take 736 steps up the TV Tower (there is a lift for lazy ones) and have some warm drink or a snack in the cafe on the top of the tower. Easy to reach by the public transport is the ice skating rink at Letná. It is located opposite the Sparta football stadium. If you want to escape from the crowds in the center, there are more ice rinks outside the center of Prague, e.g. Na Františku (behind the Old Town hospital) or on the rooftop of the shopping mall Harfa. Is tasty food something you can't live without? Are you always looking for new recipes, unconventional restaurants or food tours? Then have a look at our inspiration, we have something for everyone. If you are interested in cooking, surely go for a Czech cuisine cooking class to learn how to prepare some traditional recipes. Steps of all vegetarians (and not only theirs) should lead to the restaurant Etnosvět for the vegetarian degustation dinner. 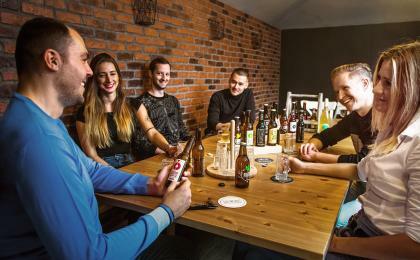 Since the Czech Republic is famous for the best beer, why not to try a beer spa relaxation including unlimited consumption of the golden drink? If you are more a cider person, don't leave Prague without a cider tasting. 1.Christmas markets: Just wander around the city and enjoy the Christmas atmosphere. Take a walk in the evening, grab a cup of mulled wine or hot mead and admire the city bathing in light. 2.Swan Lake in Prague Congress Centre: Have a break from the rush of your everyday life and let the Moscow City Ballet Group take you to the magical world of princess Odette and prince Siegfried. 3.Advent Vltava River Cruise: Escape the crowds and make the most of your Advent visit in Prague. Taste mulled wine with cookies and sing some Christmas carols during the one-hour cruise on the Vltava river.